I am an Indian Bengali illustrator,cartoonist and graphic storyteller.I have done cartooning and illustrations for many organisations. Currently i am doing freelance comics/illustrations all over the world. Hope you enjoy having a look at my creations and if you find them fascinating , just add it to the cart ! 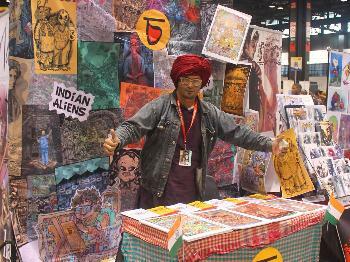 Charbak Dipta (চার্বাক) is an Indian Bengali illustrator,cartoonist and graphic storyteller.He has done cartooning and illustrations for many organisations. Currently he is doing freelance comics/illustrations all over the world. Apart from that he is also a trained singer and musician. Charbak was born in Bongaon,a small town in West Bengal,India.He went to Bongaon High School.He completed his B.A. (with honours in Philosophy) and M.A. in Philosophy and Diploma in Film Studies from Jadavpur University,Kolkata. Charbak has been drawing since his very childhood.From his college days he started taking drawing seriously.He started working as a cartoonist in the Kolkata branch of The Times of India,the largest read newspaper in India.Later he worked for various other publications and other media.In 2013 he moved to New Delhi to become a full time illustrator and cartoonist.Currently he is doing freelance art for comics,books and various other medias. I ship my creations across using reputed courier services only . Please get in touch within 24 hours in case my creation appears to be damaged on arrival .